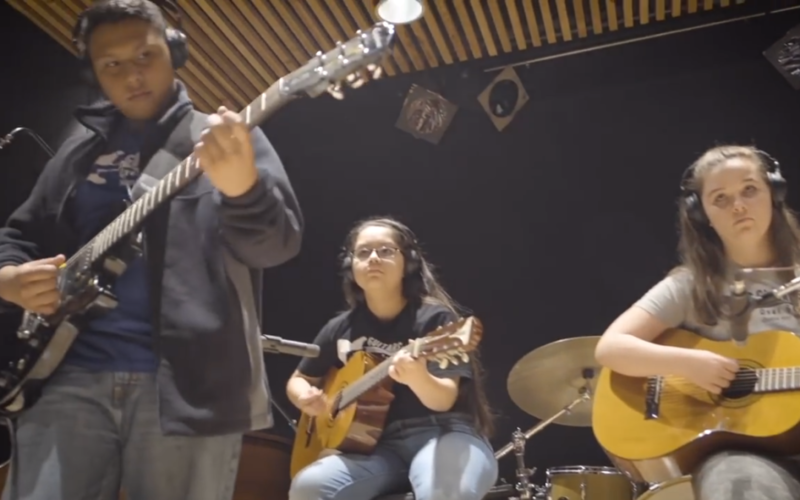 This music video project was a special experience for both students and mentors at Evergreen Academy. Being mega-Beatles fans ourselves, we definitely wanted to share with our students music that inspired us at a young age and guided us to become better musicians. After some discussion, we felt this song could do just that for them, too. The kids spent many hours after school practicing their parts, figuring out the arrangement, and working on their blend as a group. This song quickly became a band favorite and found its way as the closing number in several spring gigs. However, in addition to how great they sounded performing it, we found that the kids gravitated to the message of the song as well. This song unified them as a band. It taught them how great things can be when they learn to work with one another. It brought to light the importance of hard work, patience, and family. We tell them often that as a band, “you’re kind of like a musical family, so you need to learn how to trust each other and communicate effectively”. When the opportunity presented itself to take the kids into a recording studio to lay down a track and shoot a music video (all for the first time! ), “Come Together” was the most obvious song choice. Spending time in the studio with the kids was pretty cool. They got a real glimpse into the process involved in recording a song as well as shooting a music video. They were all smiles the entire day and exhibited loads of professionalism throughout the session. From the looks in their eyes while recording and watching their peers record, we could tell it was an inspiring day. This project is a huge testament to the growth our group had this year. They set and accomplished many goals and kept raising the bar for the next challenge. We’re so proud to call ourselves their mentors and can’t wait to get back to work next year!